Confessions of a 20-something Scrapbooking Mother: Our Elf Pictures! Here's a layout that I've been working on for about a month! These are screenshots from the dancing elf thing that EVERYONE did at Christmas, lol. The pics are not good-sorry! Both the striped and the snowflake paper is from the DCWV Christmas stack. 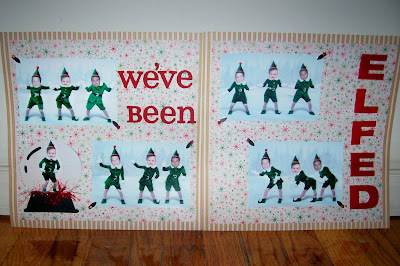 "We've been" is Heidi Swapp chipboard and "ELFED" is Making Memories chipboard. I painted both of them with red acrylic paint. The snowglobe was cut on the Cricut with Doodlecharms. I cut out a picture of Aaron as an elf and used pop dots so he'd stick out a little! I also tied a really Christmasy fiber around it. I put Stickles in the middle of all the snowflakes, too! :) I love Stickles! I used some red glitter on MM brads to help hold my pictures down! I plan to put something else on the second page, but to be honest I am feeling a little too lazy to go through all of my stuff to look, plus I'm pretty tired! So that's all for now! Thanks for stopping by and I hope you have a great day! Very cute! I love the "elfed" site. We did the four of us, and we did one with the dog! There was also a "scrooged" one, and that was pretty humorous too! Gotta love it! Very clever to do a scrapbook page about it! Way to go!